When I think of 'typical' autumn-ready makeup, I automatically think of smokey browns, burnt oranges, coppers and deep plum shades. 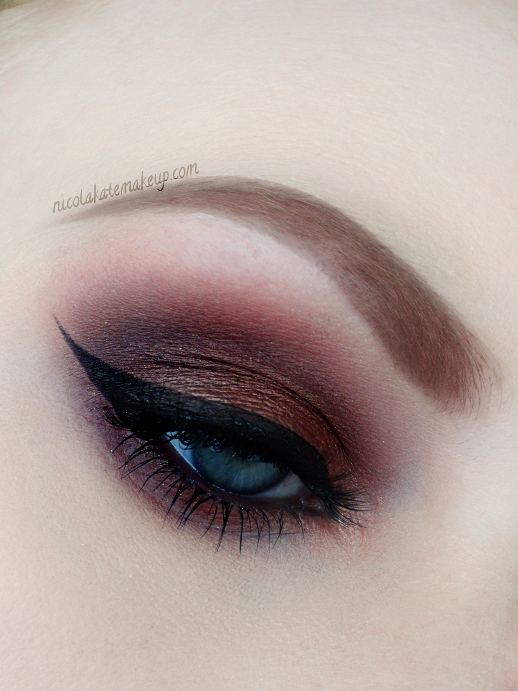 So, today, I decided to roll all of those shades into one, and I put together this classic smokey autumnal look. The 'Lavish' palette from Anastasia Beverly Hills was perfect for creating this look as it had pretty much every shade that I had in mind contained inside, which made this a very straight-forward look to put together. If you don't already own it, I'd highly recommend the Lavish kit for this Autumn purely for the reason above. Normally, I reach straight for my blackest black eyeliner. However, for this particular look I opted for a chocolate brown liner instead, to slightly compliment these shadows better (although it appears to be almost black in the photograph, waaah!). I also wish you could see the gorgeous mink eyelashes I'm wearing a little better from this angle! Because of the orange undertones in this look, it's especially complimentary for gals with blue eyes, yet is versatile enough to work on just about anybody, so give it a go! Thank you for the kind words, Ava! OMG THIS IS AMAZING. I love doing looks like this but I feel like they look really heavy on me because I have dark eyes. I think this looks AMAZING on blue eyes and light hair though! STUNNING. Yes, I would think that darker brown/copper shades like this would look slightly better on blue eyes, but no doubt brown-eyed gals could rock it too! Ughughugh just this look ugh. I can't. Haha, I hope you like it, Ada!